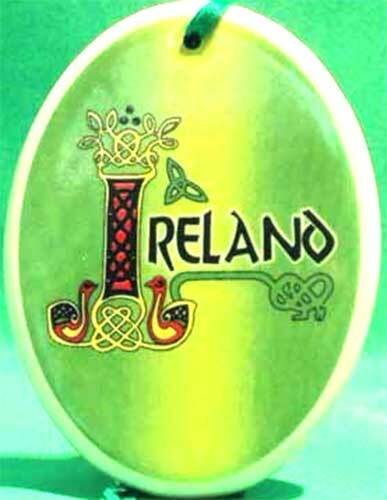 Ireland Christmas ornament features a Celtic motif that is enhanced with knot-work that includes the Trinity. This Irish Christmas ornament features the word Ireland with an elaborate Celtic motif that includes knot-work birds, the messengers to the Celtic otherworld. The Celtic ornament is a white porcelain oval shape that is enhanced with a colorful design; it measures 4" tall x 3" wide. The Ireland ornament is ready to hang with the included green ribbon; it is received on a header card with a Celtic knot history card, complements of The Irish Gift House.